13 Apr ; The Nuclear Security Summit got under way in Washington with the welcome ceremony at the Walter E Washington Convention centre the venue of deliberations. President Barrack Obama greeted each of the leaders from nearly fifty countries, the UN Secretary General Baan Ki Moon and the heads of nuclear watch dog IAEA and the European Union. Obama is hosting a working dinner where the focus will be on the magnitude of threat the world faces from nuclear terrorism. Being held at the initiative of President Obama, the participants at the summit will share their views and spell out actions to secure all vulnerable nuclear materials and prevent nuclear smuggling. The summit will also build on efforts to break black market, detect and intercept nuclear material in transit and use financial tools to disrupt dangerous trade. Earlier on the eve of the summit President Barack Obama said the biggest threat to security is the possibility of terrorist organigations obtaining nuclear weapons. He warned that groups like al-Qaeda will not hesitate to use nuclear devices and called for making nuclear materials fully secure. Top topic of the meeting is how to safeguard nuclear materials, especially the fissile materials that might be used in making dirty bomb, such as plutonium and highly-enriched uranium as well as the more widespread sources of radioactive substances, from falling into the hands of terrorists. President Barack Obama, who is hosting the summit, has set before him the goal of obtaining an agreement to secure all vulnerable nuclear materials within four years. Speaking ahead of the summit, he said, the biggest threat to world security is the possibility of a terrorist organisation obtaining a nuclear weapon. The President, who held bilateral meetings with leaders of India and Pakistan on Sunday night told reporters, nuclear weapons are not simply an issue for the US and Russia. They threaten the common security of all nations. 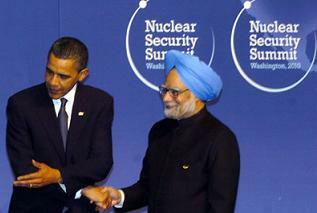 Nuclear weapon in the hands of a terrorist is a danger to the people everywhere, he warned. Obama also told reporters that terrorist organisations like al-Queda are trying to secure nuclear weapons and if they succeed, it could change the global security landscape for years to come. He said, terrorists would not hesitate to use those weapons. Incidentally, the Washington nuclear security summit would be third element of President Obama’s nuclear initiatives this season that began with the unveiling of his Administration’s nuclear strategy, the Nuclear Posture Review last week. This identified nuclear proliferation – the spread of nuclear weapons and the danger that they might fall into the hands of terrorist groups – as now the key nuclear threat to America’s security. Step two was his meeting with Russian President Dmitry Medvedev in Prague that got the strategic arms reduction process back on track. Step three is the nuclear security summit in Washington. All three events are aimed at strengthening Obama’s hands as he heads into step four, the review of the Nuclear Non-Proliferation Treaty scheduled for next month in New York. The Summit would be heralded by Obama hosting a working dinner for the heads of delegations but US officials said a sweeping or bold new initiatives to halt nuclear proliferation were not expected. “This dinner will be dedicated to addressing the threat of nuclear terrorism,” Ben Rhodes, Deputy National Security Advisor for Strategic Communications, told reporters during a teleconference. He set this tone for the Summit during his meeting with Prime Minister Manmohan Singh on Sunday night. Obama has set a goal of ensuring all fissile material worldwide are secured from theft or diversion within four years. On the table would also be major strategies to stop Iran’s perceived attempts to build nuclear weapons in violation of NPT and North Korea’s nuke weapon stockpile and exports of nuclear material weapons and technology. Before the working dinner, Obama will formally welcome each of these leaders to the summit. “This would obviously have devastating consequences both in terms of the immediate destruction and loss of life, but also implications for the global security environment after an active nuclear terrorism,” he said. “So tomorrow night, to forge a consensus view about the nature of this threat, the President will be leading a discussion with the heads of the delegations about their perceptions of the threat and, of course, what needs to be done to confront it,” Rhodes said. At the end of the two-day summit, the world leaders are likely to issue a communiqu recognising that nuclear terrorism is a serious threat and securing all vulnerable nuclear materials over a four-year period. “There will be a high-level communiqu from the leaders which will recognise that nuclear terrorism is a serious threat; which will endorse President Obama’s effort to secure all vulnerable nuclear materials over a four-year period,” Gary Samore, Senior Advisor to the President and Senior Director for Non-proliferation said. It “will pledge in a general way steps that countries can take on both a national and an international level in order to strengthen nuclear security and prevent terrorists or criminal groups from getting access to materials for nuclear weapons,” he added. “Underlining the communiqu there’s a more detailed work plan which all the countries have agreed to, and that lays out in more specific detail the concrete commitments that countries will take on a national and an international level to strengthen security,” he said.